A Spanish translation of this publication is available to download under "Additional Files" below. 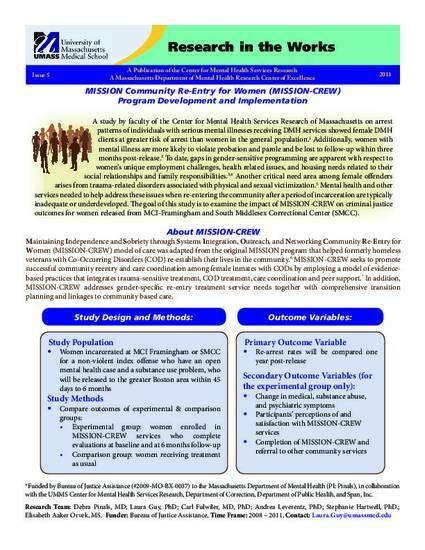 Describes a study that examined the impact of the MISSION-CREW (Maintaining Independence and Sobriety through Systems Integration, Outreach, and Networking Community Re-Entry for Women) model of care on criminal justice outcomes for women released from MCI-Framingham and South Middlesex Correctional Center (SMCC) in Massachusetts. Originally published as: Research in the Works, Issue 5, 2011.